Newest Model: 2019 Bluetooth Function. Forgot your USB flash drive at home? Want to play audio files from your phone while keeping it safe in your pocket? No problem. The KA-1000DSP's Bluetooth compatibility allows for wireless connection to any A2DP stereo Bluetooth device. That means you can play audio files from your phone, laptop or any other Bluetooth enabled device within a 30 foot foot range. The KA-1000DSP gives you the freedom to stream music wirelessly from any Bluetooth enabled device. There are also a wide set of controls to help show off your mixing and production skills, such as the Bass, Mid and Treble. These inputs also display Track Title, Number and Elapsed Time to help you stay organized as you navigate through tracks. Newest Model: 2019 SINGTRONIC KS-1000DW, You may think all speakers are the same as long as they produce good sound. Not necessarily! Let us tell you the difference. Both Hi-fi speakers and Karaoke speakers will sound good when you just play music. But with Karaoke, your vocals play the most important part. Most Hi-fi speakers are not designed for live vocal frequencies so the vocals sometimes sound distorted or muddy and surpressed when singing loud. These 100% Japan crafted speakers are built with quality materials and a higher sensitivity, providing maximum vocal sound per watt. They are also designed with emphasis on the midrange, which is perfect for live entertainment and Karaoke vocals. Each KS-1000DW speaker is protected by heavy duty polish wood. The Super Slim (8.5 in Width), compact design fits well into virtually any architectural decor. The (48 in) tall line array height provides consistent pattern control throughout the intelligibility band, making the KS-1000DW ideal for difficult acoustic environments. The combination of superior sound quality, excellent pattern control, and compact design makes KS-1000DW ideal for applications such as Home Livingroom, KTV Room, Lecture Halls, Transit Centers, Conference Rooms, Cathedrals, Multipurpose Spaces, Architectural Spaces, among many others. The innovative coverage adjustability allows switching between broad and narrow vertical coverage settings to allow matching the coverage and throw requirements of the application. Coverage can be easily switched in-venue with the speaker already installed. This innovation allows a single loudspeaker model to excel in an extremely wide variety of project types. The Vocal voicing can be set to match the application through the Music/Karaoke switch. The Music setting provides flat frequency response, while the Karaoke setting produces a mid-range presence boost to provide clear, intelligible voices even at the longest throw distances. 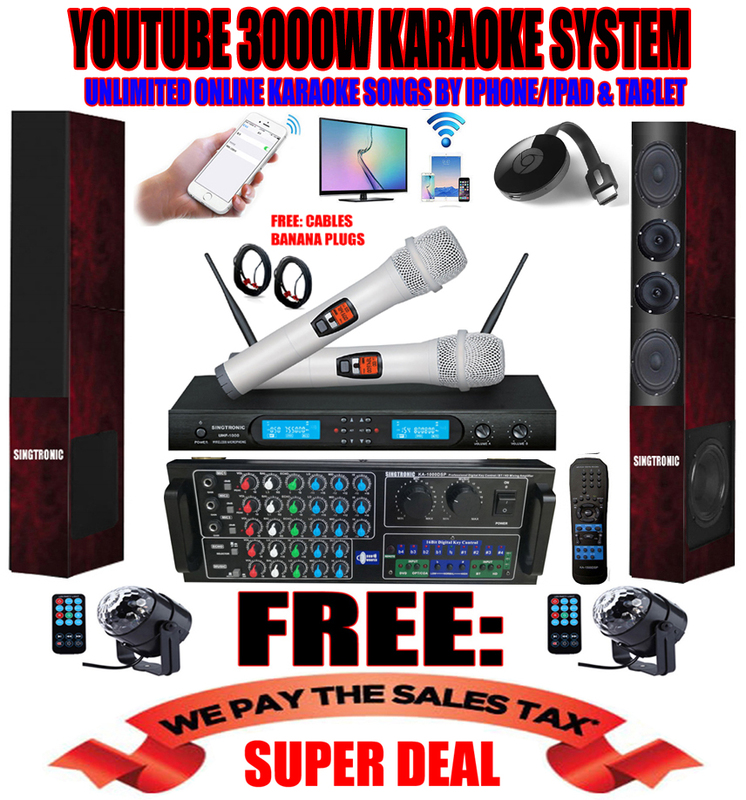 SINGTRONIC KS-1000DW, the best known named in professional karaoke around the world with unprecedented tweeters sound quality and power woofer. The exceptional quality and smoothness of sound over the entire audible range ensure unprecedented excitement. Once you have sung with these speakers, you will never be satisfied with anything less. The clubs and bars that use these speakers will enjoy an excellent reputation among their customers. We have every confidence in the outstanding sound quality of these speakers. Newest Model: 2019 SINGTRONIC UHF-1000 Professional Dual Wireless Pearl White Microphone System is the right solution for Karaoke vocalists, Home Entertainment enthusiasts and Club Patrons who have been looking for a cost effective UHF wireless solution that can fit seamlessly into a multitude of applications. Working on crowded group singers UHF frequency bands have develop it on signal, the UHF-1000 ensures the best possible performance for all singers. The world's first ever built with Heavy Duty Metalic Pearl White Color Handheld & Digital Dual wireless microphone system with LCD display. Which you can sing through day and night without worrying about cost of replacing batteries.